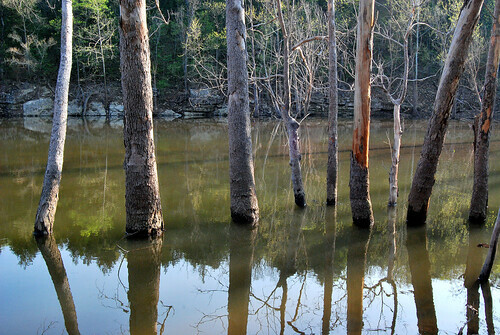 In the state of Missouri there are eight wildernesses set aside by the Wilderness Act of 1964. We are lucky to have seven of them within the Ozarks area and all of those within the boundaries of the Mark Twain National Forest. 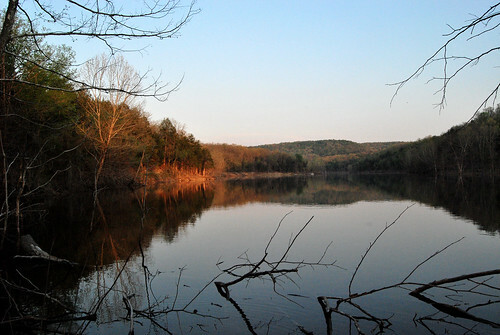 Piney Creek Wilderness has 8,142 acres which straddle the Barry and Stone County lines. It’s accessible from Highway 76 on the north and Highway 39 on the west. Nothing quite so nice as perfectly peaceful Table Rock Lake and the setting sun falling on the distant shore at Piney Creek Wilderness. There are two trailheads, the Tower Trailhead in the north and the second is in the south. The National Forest maintains five trails totalling over 13 miles, though we have found and explored several more trails maintained solely by equestrian and hiking use. We’ve marked the trails we’ve found on our trail map. The trails run along the ridge where you can see easy trail conditions and a beautiful pine and oak forest. Right off the bat, the most unusual thing about this Wilderness area is that its boundaries circumscribe the entire drainage of Piney Creek. So you always start on a ridge and go down into the valley of the same creek system. There isn’t a lot of up and down all day hiking. Once you’re down in the valley it’s flat. Piney Creek opens into Table Rock Lake on the east, allowing access to and from the lake, but only if using non-motorized boats; well that’s the theory at least. The wilderness rules strictly prohibit any motorized vehicle (wheeled or boat) within the wilderness boundaries. However, in our experience, motor boat users appear to either ignore or not be aware of this restriction. The trail map in the USDA website’s wilderness brochure is out of date (as at June 16, 2012). We’ve produced our own trail map from the latest electronic USGS topo map of the area, and our own mapping of the trails using our GPS receiver. You can also download a kmz file for Google Earth or your GPS receiver. The KMZ file includes a full USGS topographic map of the Piney Creek Wilderness area. You can see the map, and a Google street view of Highway 76 on our trail map page. The Tower Trailhead is accessible from Lake Road 76-6 off of Hwy 76 west of Cape Fair, Missouri. There is a sign on Highway 76, but there is no sign on the short track leading to the trailhead. It has a Forest Service Tower (fenced off) and a large circular parking area. These trails are frequently used by horseback riders and you usually find a couple of trailers parked here. There is a vault toilet and a couple of campsites with tables and fire rings. There is no water at the trailhead. Two official trails start from here. One, the Tower Trail, heading south and the other, the Lake Trail, heads east. Returning to the trail head via the eastern route we’ve always lost the trail near a stock pond on the ridge. It seems most trail users opt to follow an old forest road at this point until it joins Lake Road 76-6 and then take that road back to the tower. We’ve not hiked the eastern trail near the tower yet, opting to follow the road, but the trail appears to include some steep ascents and descents. On the steep trails, the water tends to wash away the dirt exposing rugged rocks. The steeper it is, the more rocks. This is particularly nasty to descend. 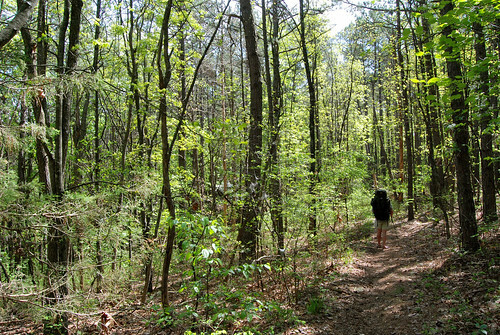 Lake Trail – Piney Creek Wilderness – Fall 2011. The terrain is quite steep with relief of over 400 feet. Both of the official trails from the Tower Trailhead involve a rugged and steep descent that’s as rough as any you’ll find in the Ozarks. Definitely bring your hiking poles and take it slow. 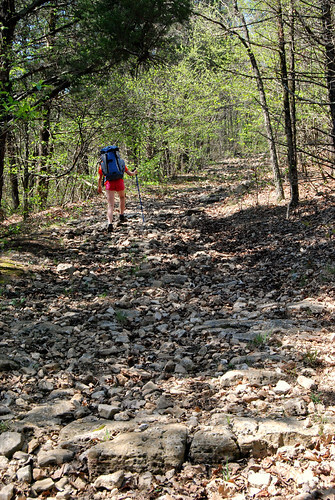 The ridges are mainly pine and oak forest and as the trails descend they tend to wind around typical Ozark glades with rough rock outcroppings and seeping water. We’ve found the trails to be challenging on the steep parts and moderately easy on both the ridges and valleys. The glades can be downright treacherous with loose stones, large rocks to step down, and poor footing. You have to watch where you step while climbing the steep trails. Once the trail descends to the valley, it wanders along Piney Creek itself, often crossing it. Unless it’s been very dry, you will get wet. On the upside, though, there are no concerns about finding water here. Even if the creek is dry you will find water at the lake. The terrain at the bottom of the valley is a flat and easy trail. The lowlands along the creek get very muddy, become overgrown with seasonal growth and you’ll get to know catbriars and poison ivy up close and personal. It can be quite buggy, even in winter. Make no mistake, this is a wilderness and you need to be equipped for being in the wild. We’ve not yet hiked all the trails, but even the more level ridge trails leading from the south trailhead has some steep and rugged descents. In spite of all the warnings, this is one of our favorite wildernesses. It’s quite isolated so there is not a lot of traffic noise or signs of the outdoor world, though motor boats on Table Rock Lake can be heard at times. The steep valley sides give a feeling of enclosure. The variety of terrain makes for an interesting hike and also gives an ever-changing view of the plant life. You’ll see high ridges with pines, glades with scrubby oaks and cedars, creek valley with sycamores. The valley opens out to a scruffy area that is underwater at various times due to fluctuations in lake levels. What this spot lacks in botanical beauty however, is more than made up for in bird and insect diversity. The lake shore is a great place to sit and watch the day go by. You will be entertained, I assure you. This wilderness used to house farmland and if you look carefully you can see signs of previous human habitation. The entire area near Shell Knob and Cape Fair was a huge tomato growing area in the early 1900’s and you can see overgrown areas that certainly used to be farmland. Not so great for swimming, the water is a bit muddy here. But the colors are great. There is lots more information including a printable brochure with topo map at the Piney Creek Wilderness entry on the Mark Twain National Forest site. Don’t expect there to be a map available at the trailhead. Unfortunately the map in the brochure is out of date. We’ve produced a new map from our GPS and the accompanying KMZ file includes a full USGS topo map of the area. Don’t hike these trails without a map and be warned that some trails have moved significantly since the official map was created, so it should be used for general guidance only. The trails are only blazed at crossings and it’s sometimes hard to find where the trail picks up after crossing the creek. All this writing and now I want to go back. I love it there. The main hazards we’ve encountered are the steep ascents and descents with a loose footing. The lower valley is prone to flooding, and we’d advise caution if rain is expected, the going will be very muddy and the creek crossings could be potentially hazardous. A lot of the trails are not officially maintained and have a large number of fallen trees on them. We found adequate cell phone coverage on the north and South ridges and at the Tower Trailhead, but had no signal once we were down in the Piney Creek valley. We’ve seen plenty of poison ivy alongside the trail, and we recently came across a large Timber Rattlesnake sunning itself on the Piney Creek Trail. You should be prepared for all the usual Ozarks hiking hazards that plants, animals, terrain and weather can throw at you.